The Dad's Lone Star quilt requires fusible web and stabilizer. 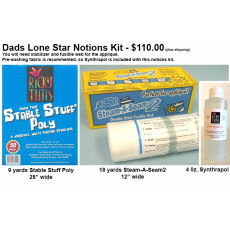 We are offering this Dad's Lone Star Notions Kit for $110.00, making this over 10% off retail price. The Notion Kit includes 9 yards (L) x 28 inches (W) of Ricky Tims Stable Stuff Poly, 18 yards (L) x 12 inches (W) of Steam-A-Seam 2, and 4 oz. of Synthrapol for pre-washing. For shipping purposes the Stable Stuff Poly will be gently folded in a box with the Steam a Seam 2 Rolls instead of its usual shipping method of being rolled separately in a tube. This item may take up to 2 weeks to ship.